join millions of others and learn how to launch and scale your business effectively in today’s marketplace. Organic Networker® is considered to be the "new bible" for network marketing by the industry’s top 75 millionaires. It stimulates considerable thought that takes you far beyond a how-to book. Interwoven, throughout, are Kosta’s 12 Organic Principles for Success, giving you practical, straight-forward tips for turning adversity into victory. You will be embraced with the knowledge and wisdom that he attained and followed through with to build the inner strength necessary to achieve a level of success that changed his life and will change your personal and professional life forever. DISCOVER THE $24 MILLION BEST PRACTICES OF ORGANIC NETWORKER. Do you want to avoid the typical network marketing rollercoaster? Chapter 2 - Why Organic Networking? I have known Kosta for more than a decade through his journey from top field leader, company owner and now vendor to the industry. Every step of the way he has exemplified professionalism, wisdom and integrity. Kosta has lived what he teaches in Organic Networker. This book is a “must have” for anyone with a desire to grow a thriving network marketing business. I am compelled to tell you how powerful Organic Networker is. No other authors in the network marketing space come close to Organic Networker's intensity, purposefulness, awareness, knowledge, expertise and more. Organic Networker – meaning Kosta Gara – is here to further dominate the network marketing realm. His exceptional dimensional and global experience is nonpareil. I believe 12 Organic Principles will seriously affect people regarding the way they think and live. Concomitantly, people who want to succeed are more likely to do so and people who cannot or are unwilling do so will get the hell out of the way. A leading talent of his generation, Kosta Gara has invested 20+ years into mastering the art of networking and crafted what he has learned into 12 organic principles for lifetime achievement. The Result is a truly intuitive, must read for anyone seeking success in the industry. I've personally known Kosta for nearly a decade and have the utmost respect for his hustle as he is a world-class entrepreneur and demonstrates his skills by walking his talk. Business is all about relationships and the Organic Networker is a must read for anyone in business, regardless of their industry or profession. He teaches people the necessary skills to do business globally in this modern day with elegance and grace. This book has helped me earn a residual income that has replaced any of my former corporate salaries above and beyond. I'm so grateful for Kosta's guidance and I continue to grow my team by helping them earn a few extra hundred dollars a month to a lifetime of residual income as a legacy to their families. Kosta is one of the world’s foremost experts on network marketing. He’s a highly gifted entrepreneur, author and skillful coach in the industry. I’ve personally known Kosta for over a decade, and have found him to be a man of the highest integrity. Following his guidance, I was able to earn a solid six-figure income in my second year in the industry. A must-read for anyone new to network marketing, or looking to create lifetime residual income. CEO, True World Global, Inc.
Kosta Gara knows first-hand how to turn adversity into victory. Read Organic Networker and you’ll have all the insights you need to achieve success beyond your wildest dreams regardless of your personal circumstances! Kosta has a remarkably ‘simple’ way of turning communication into an art and as well a strategic weapon for an organization... Any leader looking to strengthen their team and accelerate results should get to know him and his methodology. In this day and age, in order to accomplish the success you dream of, there is a set of skills required whether it’s in network marketing or direct sales. Kosta’s book Organic Networker provides you with the necessary skills required to build a solid foundation that empowers you to earn lifetime residual income in the industry. The 12 Organic Principles embodies the tried and true real life experiences of his life that are pillars one needs to create limitless wealth. Kosta Gara is one of my favorite people on the planet. He walks the talk and is very generous in sharing his own secrets to outrageous success in business. To get ahead in today's high tech world, you need a critical set of skills that perfectly blends high tech with high touch. Kosta's new book, Organic Networker, delivers exactly that perfect blend. Apply the principles in this brilliant book to your life and business, and you'll be well on your way to building incredible wealth and success. I’ve known Kosta for nearly 15 years, and with his well-documented success year-over-year, I cannot believe he is actually sharing his secrets that made him a multi-millionaire. Organic Networker is a tried and true methodology for the new era of network marketing. The greatest challenge for everyone starting out in network marketing is they don't know what they don't know. Kosta Gara's Organic Networker answers the questions we never knew to ask about growing unlimited wealth. Kosta knows that path because he's lived and breathed it. And the proof is that he's earned millions from the advice he shares. His story will surely move you closer to your success. I can't get out of my mind what Kosta Gara endured as a youngster. The fact that he survived and went through so much pain, much less became incredibly successful, is heroic. The book is very well written, I really enjoy the writing style and it's really having an impact on me. Napoleon Hill/Clement Stone was my "hero" as a young man. Joe Paterno, my famous Penn State football coach, and I became friends while I was in college and became a hero to me as well. I think now I have three heroes touching my life. I am most grateful to have met Kosta and have the opportunity to learn from him. Networking is a business that can greatly prosper and expand anyone with desire, discipline and the repetitive decision to do it with the spirit of excellence. 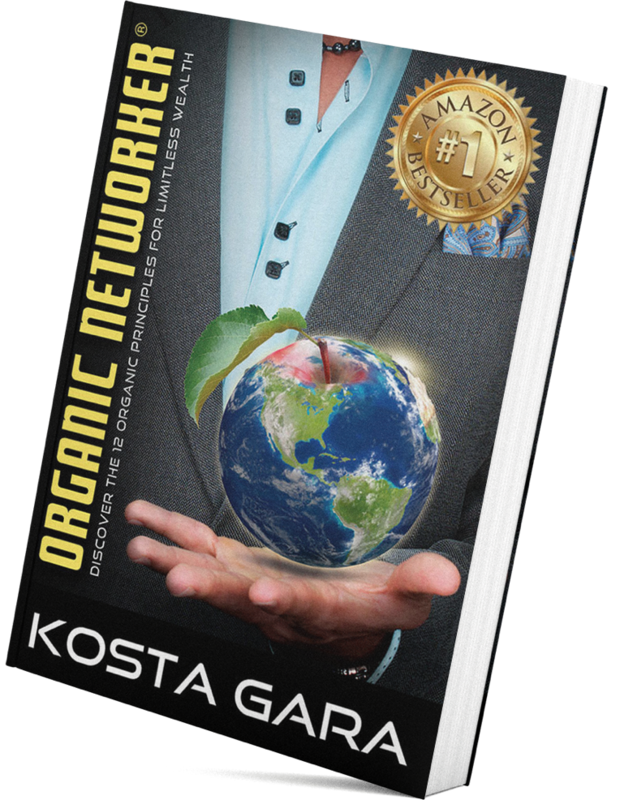 Kosta's Organic Networking principles will teach you everything you need to know to become a super success in this business, if you read, reap and fully apply his hard earned wisdom.